As we approached the entrance, the door was pushed open from the inside by a spunky old man who welcomed us in with a handshake and a warm greeting. We walked down the hallway and were greeted by several people, including a man who I recognized from some Chamber of Commerce meetings we had both attended, and were asked for our first and last names several times. We passed through the hallway into the lobby area outside the sanctuary, where we saw a small room off to the side with a coffee sign above it. Laura and I had been running late this morning and did not have the chance to get our morning coffee, which is a very big deal, so we headed straight for the small coffee room to grab a quick cup before the service. On the way through the door, I noticed that all the people inside the small room had on long white and gold robes and were seated in chairs around the perimeter of the room. I quickly got the feeling that this domain might only be intended for people in the choir or ministry, but rather than turning back for fear of interrupting something, the desire to drink coffee drove us onward to our destination. As we filled our cups, I awkwardly asked if it was OK for us to be in there, to which one of the robed men replied that we would now be required to sing in the choir. We exchanged a few jokes about how they really did not want me or Laura singing in their choir, and even though we were obviously out of place, the robed people simply made light of it and welcomed us in. They even went so far as asking Laura and I to join hands with them as they prayed for the service that was about to take place, that God’s message would be spoken through the pastor, and that the Holy Spirit would fill the place with His presence. I was thoroughly impressed that they did not just ask us to step out while they prepared for the service (and I would not have been offended at all had they gone that route), but the fact that they included us without making us feel embarrassed was pretty cool. These Lutherans are alright. We only managed a few quick sips of coffee before we hurried on into the sanctuary, doing our best not to be late. We slid into a front row wooden pew to the left side of the pulpit area, and settled in while glancing over the bulletin. Upon first glance I did not really grasp the functional layout of the sanctuary. It was an octagonal room with a stained glass ceiling trimmed in wood. 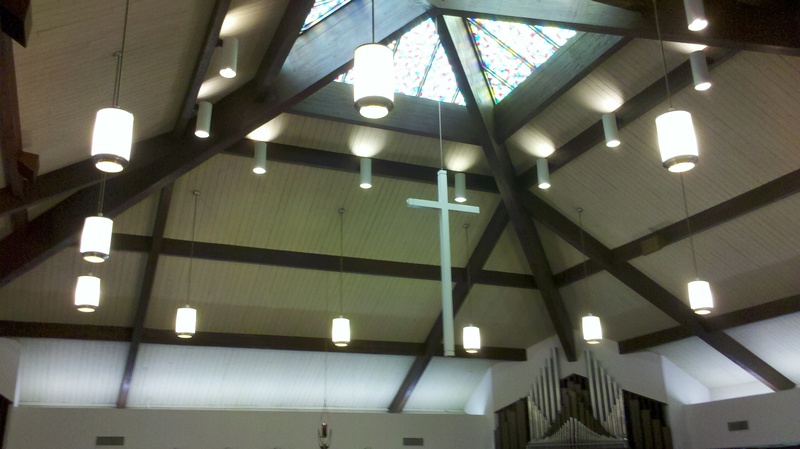 A large white cross descended from the ceiling in the center and hung just above a smaller octagonal platform enclosed by wooden rails with kneeling pads around the outside. 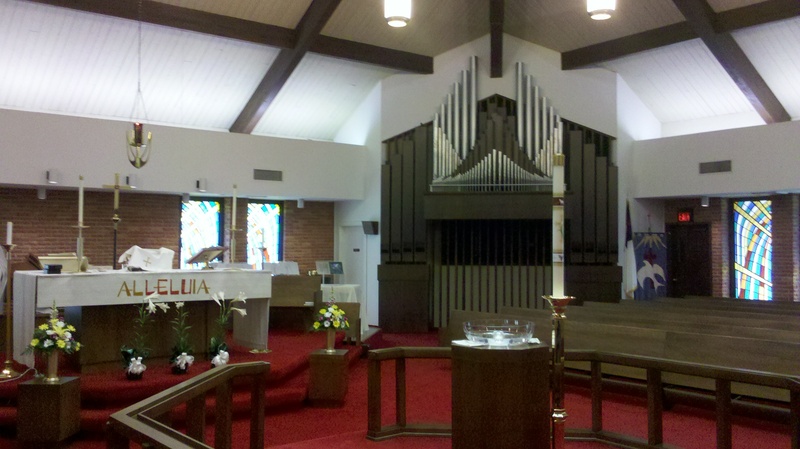 The pews wrapped around three sides of the middle platform, with the back of the room containing the choir area, an altar with an open Bible and smaller cross suspended above it, and the large pipes from the pipe organ off to the side. In the middle of the center platform was a wooden stand with a glass bowl full of water and large white candle with gold caps adorning it. 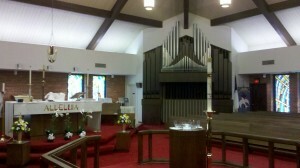 The pipe organ trumpeted to life with a processional as the choir somberly walked in and took their seats. The pastor, Gary Schimmer, whom we had met in the hallway (and who did not introduce himself as the pastor, but only by name), walked into the center platform area to begin the service, and it wasn’t until this moment that I realized it was the pulpit, which surprisingly did not have a podium for the speaker. Instead, pastor Schimmer just strolled around freely as he addressed the congregation, facing different angles to engage everyone directly at least some of the time. Pastor Schimmer held up a tattered piece of paper that he had found on his property while cleaning up from the storm, which he explained was a cancelled check from someone in Alabama. He took a moment to greet everyone who had been affected by the storm, and offered the church for shelter, hot showers, or laundry facilities for all who were without power or had severe damage to their homes…a gesture I’m sure many churches have been making during these tragic circumstances. I craned around to survey the congregation from my front row seat, and noticed that the room was only sparsely dotted with attendees and was way below capacity. The majority of the congregation was made up of the elderly, with far fewer middle-aged people, even less (only a couple of other people) who were in my age bracket (mid-30’s) or young adults, and a handful of young children. I took all of this in while a church member, after being invited up by the pastor, entered the pulpit area to share his “vision speech”. 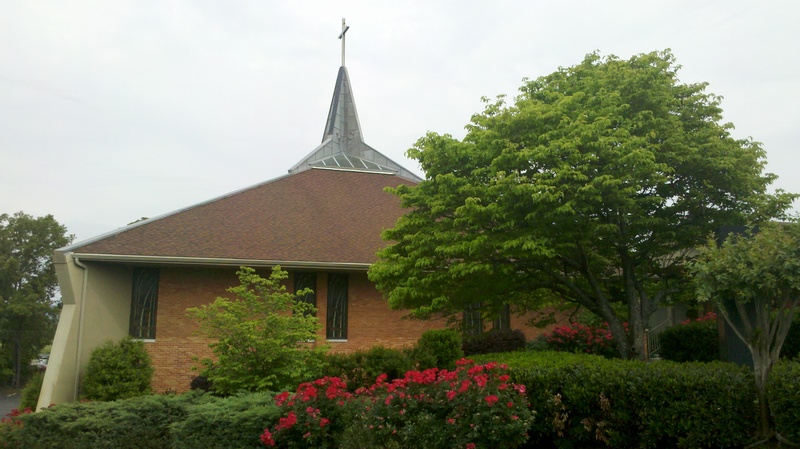 Apparently various members of the congregation had been coming up each Sunday to share their vision for Trinity Lutheran Church. This week it was Mike, a beefy middle-aged man who spoke with nervous conviction about how much of an impact he felt the church could make on people, but openly acknowledged the lack of attendance they were currently experiencing, even calling it a problem. This thought about an aging congregation struggling to attract new and younger church-goers held my attention for the rest of the service. All throughout the hymns and responsive readings, the children’s church segment, and even during pastor Schimmer’s moving sermon about the breath of God giving life in Genesis and the resurrected Christ breathing the new life on His disciples, I could not help but examine this experience as it was happening, wondering how or why the format of their service might contribute to the attendance problem. Pastor Schimmer began to talk about how the first business of the Church is forgiveness, and the second business of the Church is to give life as we were given life. We sang the hymn “Breathe On Me Breath of God”, and then all baptized Christians were invited to come up and kneel at the pulpit to receive communion. Laura and I quietly went up and knelt and received the communion wafer representing Christ’s body that was broken to pay for our sins, and dipped it in the wine representing Christ’s blood that washes our spirit clean. After the service, a couple of the women, Eleanor and Shiel (sp? ), came up to us to thank us for attending and invited us to come back the next Sunday. We explained that we went to a different church service each week for the ChurchSurfer blog (which I don’t think they completely understood), but we thanked them numerous times for their hospitality and then stuck around for a little while just enjoying the conversation. As we were leaving I began contemplating scenarios in the different churches that I have attended this year, comparing the number of people in attendance with the type of welcome we received. Is it possible that the churches that are experiencing growth do not feel the same sense of urgency to identify and reach out to visitors? Would it make sense that churches that have long maintained strong attendance levels somehow become more concerned with creating new programs to offer to their existing members rather than programs designed to welcome in potential new members? Do these same churches assume that visitors will see the crowds of people in attendance and automatically want to join in also, thinking that if so many other people like it here so will I? What if every church actively sought out visitors to honor them as esteemed guests and desired to make them feel welcome and special out of love rather than a sense of obligation? 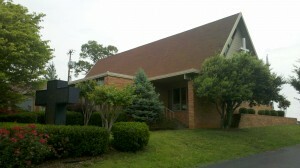 The people of Trinity Lutheran Church were focused on doing these things for us, but I wonder if they got to that point after poor attendance had become a problem, only realizing their mistakes when it was too late, or if they’ve always been this way and younger Christians are just looking for a more contemporary service. I’m not sure of the answer, but I’m glad to have experienced their kindness and pray that God provides the increase in attendance they seek. If you ever need a reminder of just how little of what happens in this life is under our control, just ask someone who has been through a tornado, hurricane, tsunami, or other natural disaster what their experience was like. Everything changes in the blink of an eye, and there’s absolutely nothing you can do about it. Plans, commitments, activities, possessions, and responsibilities get ripped from our lives like a 200-year-old oak tree in a 175-mile-per-hour vortex of wind, and all that is left is pure devastation that washes over you along with a tidal wave of emotional responses. Fear, the will to survive, pain, sorrow, grief, thanksgiving, love, shock, compassion, charity…depending on your circumstance, you may experience one or all of these emotions within yourself and from others. For those of us in the Chattanooga area and around much of the Southeastern United States, April 27, 2011 is a day that will not soon be forgotten, specifically for those reasons. As some of the worst tornados in the recorded history of the U.S. swept through our lives, we were all either directly or indirectly affected and forced to deal with the realization from my opening statement…we are in control of very little in this life. But along with that realization comes a very important addendum. We are in total control of what happens after this life. With all the various forces at work in the world that have the potential to create endless scenarios and situations in our lives that could produce limitless numbers of outcomes based on how we respond, it can be simply mind boggling. How great is our God, however, that He gave us one single choice to make about where we want to spend eternity after this life, and the complete free will to do so. This entry was posted on Sunday, May 8th, 2011 at 9:26 pm	and tagged with Chattanooga, Christianity, church, ChurchSurfer, communion, Hixson, Lutheran, May 1, Tennessee, Trinity Lutheran Church and posted in Church Experiences. You can follow any responses to this entry through the RSS 2.0 feed.